Augusta Free Press editor Chris Graham is running the TCS New York City Marathon and raising money to benefit the American Foundation for Suicide Prevention. Graham announced plans to run to benefit AFSP more than 7 months ago and has received 53 donations to date totaling $3,686. He joins a team of 15 runners who have raised more than $52,000 to date. 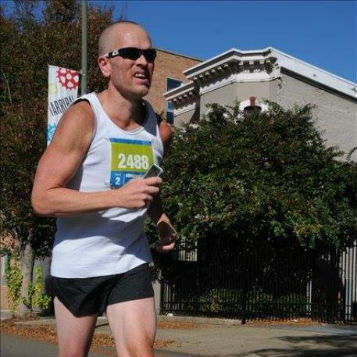 Graham started running two years ago and ran the Richmond Marathon last fall and the Charlottesville Marathon in the spring. He also completed the Park to Park Half Marathon. Graham said he won’t be in the lead pack, so he won’t be on TV for people to cheer him on, but he’ll be in the pack of runners wearing his AFSP #StopSuicide tank top nonetheless. To track Chris Graham on race day, download the TCS New York City Marathon Mobile App from the App Store or Google Play.